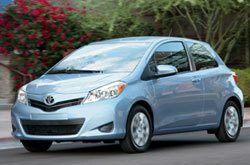 Please look below the video to begin reading a full review of the 2013 Toyota Yaris. Our Toyota reviews are compiled by veteran automotive writers - it's just another resource we provide as a chief Toyota franchise in Evansville. Make educated decisions when it comes to your next auto purchase, don't take guesses! Each passage is brimming with data and vehicle features in way that's easy to understand. Is the Yaris your ticket to freedom on the road? Read on and find out. Compare the 2013 Toyota Yaris next to vehicles like the 2013 Hyundai Accent, Ford Fiesta, Chevrolet Sonic and the Honda Fit, and you'll see that the Yaris scores higher the competition in many areas. Get a load of our Quick List below to find out why! 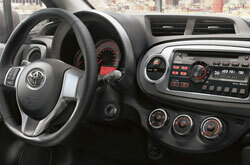 Kenny Kent Toyota auto repair service in Evansville is only a click away! Your Toyota deserves to be treated with the utmost care - that means Toyota factory- trained technicians, reliable 2013 Toyota Yaris parts, and the reassurance that comes from a 12-month service work warranty. Toyotas in Evansville can take a pummeling, so turn to the auto repair buffs in Evansville - Kenny Kent Toyota. We do a wide range of services, from effortless serpentine belt replacement and ordinary inspections to more challenging jobs such as muffler repair. For both challenging and simple services, our Evansville car repair center covers everything; plus Kenny Kent Toyota offers cheap maintenance pricing. Take a look below to view money-saving service specials.